Claire and Jamie have been some of my best friends for years now. Sometimes I feel like I need to give them a call. You know, to see how they are doing . . .
what they've been up to. When I heard - about 2 years ago - that an eighth book was ready to drop (that's cool talk for when a new CD comes out - I just thought I'd use it for a different genre) I had just completed the last of the already published books. I was so excited I thought I would just do a quick re-read of the series. Then one day when my sister and I were once again bemoaning the delayed release of the latest book. She started talking about all the things that had taken place in the last book of the series. I kept saying, "Wow, I don't remember that!" So much that I finally walked up the stairs to the landing holding the bookshelf where her library of Diana Gabaldon books is lovingly kept. I had somehow never actually read book #7. All 4000 900 pages of it. Then, after another delayed release date, I returned to my series re-read. 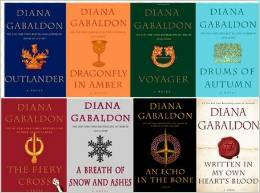 Consequently, there has never been a day in the last three years that I haven't been reading one of the Outlander books. The other day I finally finished book #7 for the second time. That means I finally got to start reading THE NEW BOOK!!!!!!! This could be the most exciting thing that has happened to me in the last year. I'm finally getting to my point. 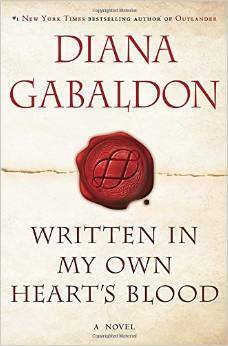 Diana Gabaldon is diligent to use words that are historically, culturally and linguistically, appropriate. Most of the words are recognizable by context. Some are used repeatedly. You quickly figure out that "ken" is the way the Scots say "know." You ken? If you "knew" something, you kent it. The easiest one is "didna" or "dinna." I dinna ken if this is an real word or just used to demonstrate the accent of the time in Scotland. Do you know what bairns are? Children - used rather like we used the word kids now. My favorite unfamiliar word of the first seven books is "fug." You would know what it meant if I was willing to go through the 9000 pages of the books to find a sentence for you. Fug is a great word for "the heavy air in a closed room, regarded as either oppressive and murky or warm and cozy." The way it is generally used in Outlander times is to describe the thick murky stench around you when you sit in a tavern or inn filled with the smell of unbathed (for weeks usually) Scotsmen and Englishmen. These days I might use it to describe to the smell of a lake cabin in the woods that sits closed up for the winter. Or - the atmosophere in night clubs or airplanes when smoking was allowed. I haven't confirmed this, but I feel like a possible reason for all the delays in the publication of Written In My Hearts Own Blood was due to the author's determination to expand my vocabulary or reintroduce me to words seldom used or long forgotten. Like incipient. I thought I knew what incipient meant. I don't know WHAT I thought it meant . . . I had no idea what absquatulated means. Even my spell check doesn't know that one! You must use an unabridged dictionary for absquatulate. None of these words stumped me while I was reading. Not being able to define them didn't keep me from reading. I could have defined them relatively accurately if I had been forced to at the time I was reading. But I wrote them down - and looked at them a week or so later. If I couldn't remember the context, I couldn't define them. I'm going to play a little game with you. These words will be defined today on my Facebook page! I know my Facebook friends will be thrilled! Karen, I know just about all of those words. They are the same ones used by Catherine Cookson in all her books...and also by Mary Pearce. I dearly love the language. Fun words! I tried to read the first book of that series and gave up. Just not my type of book, but I'm glad you're enjoying them. I don't know this series at all, but I am going to check it out tonight. I love to read books that keep you going for years. I don't know these books at all but I do know about bairns, cairns and I didna ken. Didna is short for did not and the Scots still use ken today. As for the others, I think I know alacrity and diffident so wouldn't look them up, but if I did, I'm sure I'd be wrong ! Great goodgobbletygoop. Was that in the book?